All lace benefits from a savage blocking. Is your Wingspan looking flabby? It’s probably not your knitting technique. Try blocking it and see. 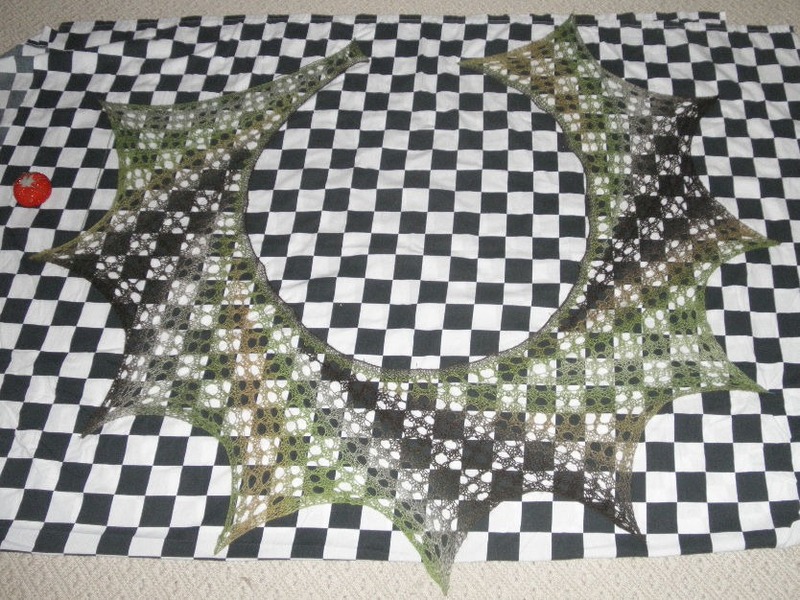 For the record, I used my visually horrific checked sheet and damp-blocked my finished Lattice Wingspan. First I dampened the thing and squeezed it out gently (no wringing). I patted the center curve into shape and pinned it first. Then I used a minimal number of pins – just one at each point – to pull the points out from the center. Finally, I let it dry overnight. The ends? I don’t darn in ends until after I’ve blocked. Especially on lace. Finishing off the end may introduce a small area that does not stretch like the rest of the piece. Better to let them hang, then deal with them after blocking is over. However I add one variant. 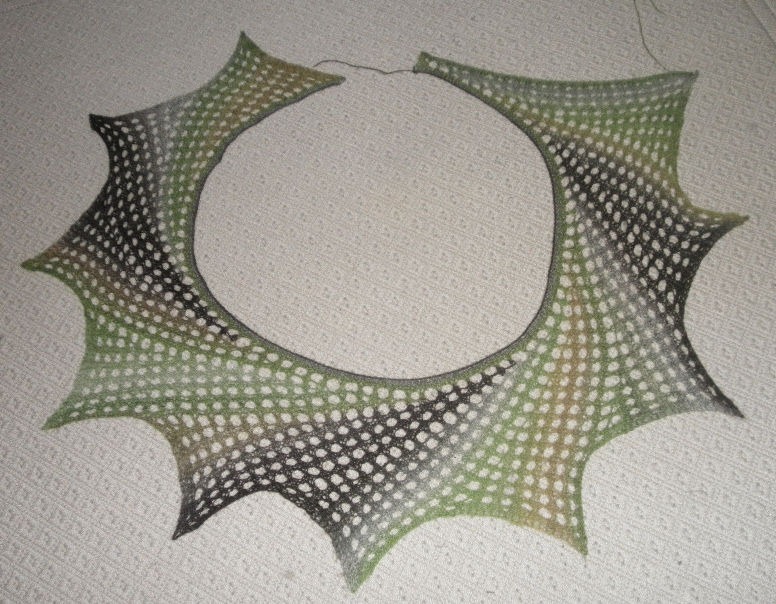 I use my old but rather large salad spinner to dry out the shawl, it spins with a pull cord but you can vary the pressure so it is very gentle and leaves a shawl damp but not soaking or squeezed and it can be easily and quickly blocked even in winter. Salad spinner! Excellent idea! Especially for delicate lace. (Files this away for future reference). -k.
I’m really enjoying your web site which I’ve just discovered in a search for knitting terminology in Russian and Hebrew. No luck there but lots of pleasure exploring your goodies. I’m in the process of moving myself from my many years long status as a rank novice knitter–as in knit, purl, period!–to becoming more skilled. Thank goodness for YouTube tutorials and websites like yours which give knitting patterns and tutorials. 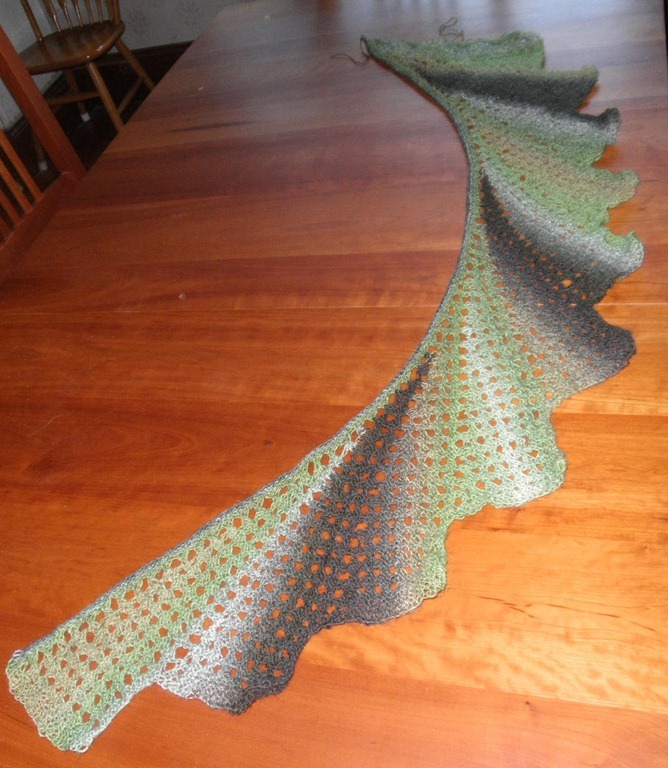 Your lily of the valley stitch and the kombu scarf are both things I’d like to try. Both will stretch me quite a bit. I bought some inexpensive acrylic yarn to play around with and am knitting a good sized sample of feather and fan stitch. If I keep going it could be a scarf. My question is, is there any value to blocking synthetic yarn? Will it respond to the blocking? Also what type of cast on creates a soft, loose base? I’ve found stretchy ones suitable for ribbing but I’m looking for one suitable for lace. I tried long tail with a larger needle as well as spacing the stitches out wider on the needle. It’s still pretty firm. What can I use instead? Thanks for your patterns and a lovely site! Nili – If i may, I’ll try to answer your questions in my next blog post. They’re great questions, and deserve more than one-line answers. In the mean time, thanks for your kind words! I do hope that knitters of all level enjoy the stuff I post, and that beginners especially are encouraged to try new things when they see them here. Also I do hope to someday expand the knitting glossary to include non-Latin alphabet languages and common knitting symbols. That’s a big job, and there are other big jobs in queue before it. Like finishing and publishing my second book on historical embroidery. Watch for the new post and happy knitting! -K.
Thanks, Kim, for your mind blowingly fast response. I look forward to the answers to my questions. Is there a way I can subscribe to your blog posts? Shalom! If I find info that you want/need how do I get it to you? The “About” tab that appears at the top of every page on this site leads to a summary that ends with an email address for me. Other than that, you can reply to specific posts if you have questions or comments related to their content. …So I followed the link you kindly provided and then went to Amazon to compare prices. There I also saw a book called Cast On, Bind Off: 211 Ways to Begin and End Your Knitting [Hardcover-spiral] by Cap Sease I have been reading the pages one can see online and have already learned a lot. Now to choose which of these to get. Thanks Judith! After knitting, and blocking, does the item always have to be blocked after washing?? I am thinking about gifts to people who would probably not be that meticulous. It depends on the type of article knitted, the yarn used, and the method used for the initial blocking. Wool and wool blend sweaters and non-lacy items – usually not. Washing and drying flat, patting roughly into shape when the object is laid out is perfectly good. Some lacy stuff can be washed and also fares quite well with just a pat-out as it dries. This fine wool scarf for example, tortured to within an inch of its life when I first blocked it will look fine after a wash. Maybe not as crisp as the “after” picture above, but not as rough as the “before” either. But lace knit from cotton, or more complex lacy items that depend on stretch to open up the form – those do need to be blocked every time they are washed in order to show the lace to best effect. Cotton doilies for example need careful post-wash handling to restore them to their dramatic selves.